The sight of a hummingbird is always a delightful surprise. Their mesmerizing flight, flashy feathers, and tiny size are so captivating — who wouldn’t be happy to serve such an enchanting visitor, and hope for their return! 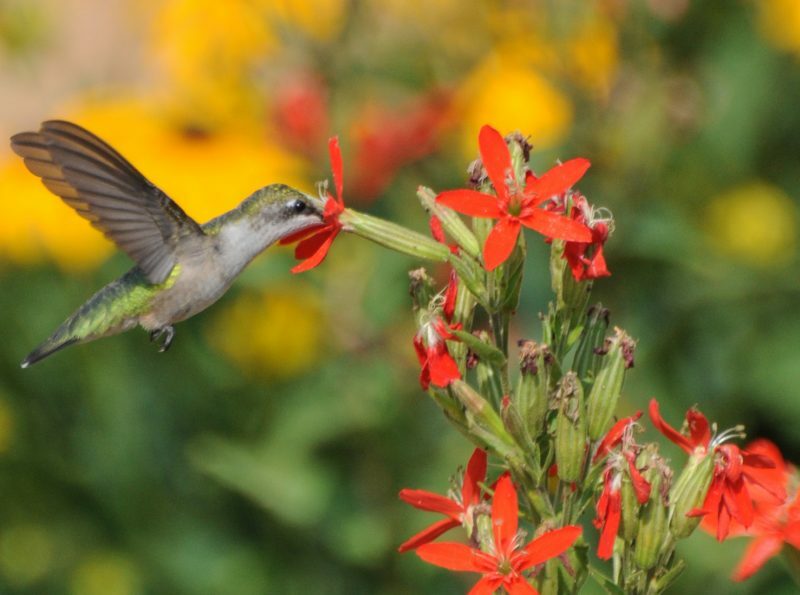 Understanding a little bit of what brings them in can help you create a more welcoming setting for the next time a hummingbird graces your garden. North American native plants — with the right features — offer the best support for our native hummingbirds. The “right features” are features that meet their unique needs: the right colors, the right shapes, and lots of nectar. Unlike other pollinators, hummingbirds don’t rely heavily on the sense of smell to find nectar. Instead their extremely keen eyesight helps them find what they need. Hummingbirds see color as well as or better than humans, but they also see ultraviolet light, which really amps up the color intensity. Bright saturated colors, rather than the sweet smell of nectar tell them that food may be available. Hummingbirds hone in on bright reds, pinks, rich lavenders and blue colored flowers. Orange is also good, but they are less attracted to white or yellow blossoms. Though they don’t visit them for nectar, the deep pink color of roses can lure hummingbirds in for further investigation. Their visual acuity serves their rapid flight and slick maneuverability as well. Flower shape is an important feature. 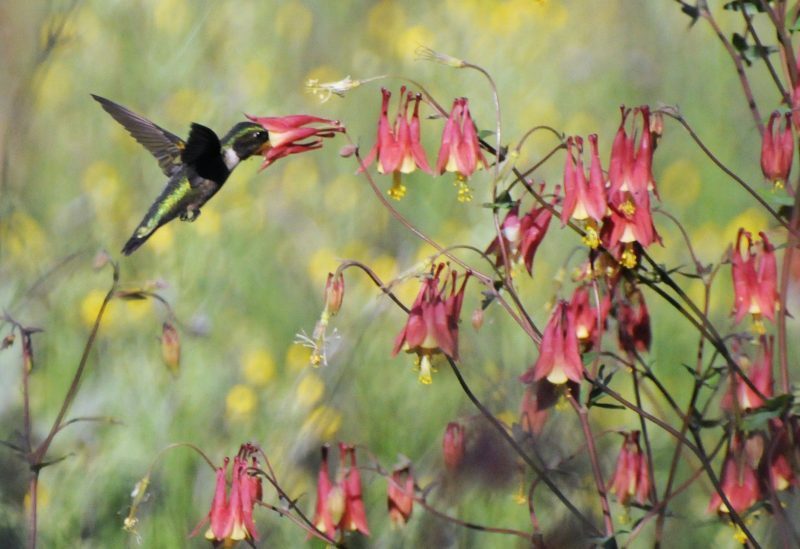 Tubular flowers with deep nectaries are required, as hummingbirds have evolved both qualities and abilities that allow them to access a tube-shaped opening — their long beaks being the most obvious. Hummingbirds are able to reach deep into a flower with their beak, where they then lap at the nectar using their (also long) tongue. Their amazing hoverability allows them to fly-in-place while they feed. The competition at tube-shaped flowers could be less than the competition at open-shaped flowers, which have easy access, a stronger aroma and may attract numerous competing visitors at once. Penstemons, Liatris, Lobelia, Coral Honeysuckle, Monarda and Catchfly are all good examples of tubular flowers. 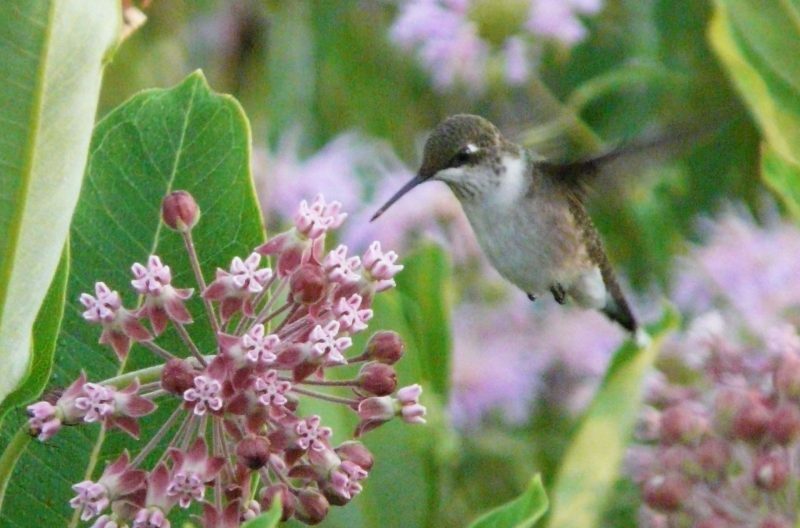 Besides nectar from flowers, hummingbirds also eat small insects. 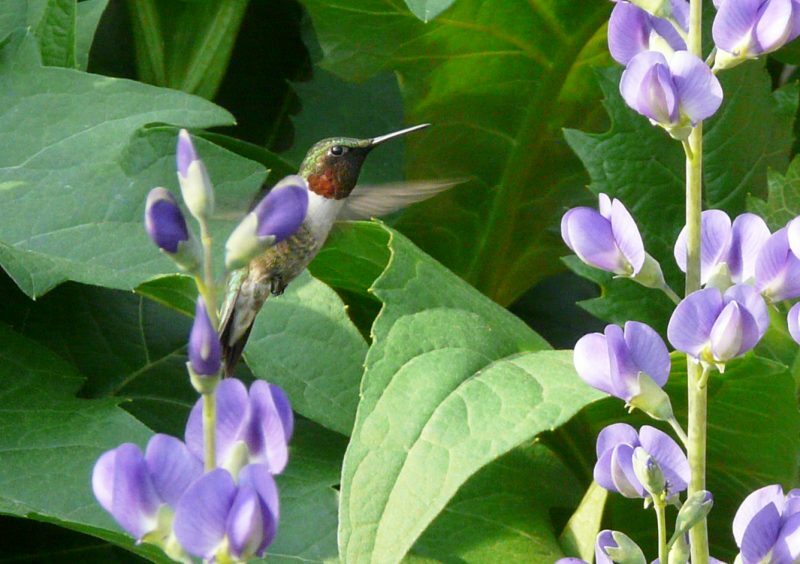 Flowers such as New Jersey Tea, Yarrow, Milkweeds, Elderberry and plants with flower clusters often attract numerous ants and other small, hummingbird-sized fare. The tiny hummingbird has a huge appetite and requires a good deal of fuel for their high metabolism and zippy flight. The average hummer eats about half of its body weight in nectar and insects a day, feeding every 10-15 minutes throughout the day. Between meals, hummingbirds spend time perched in trees, overseeing their territory, and basically resting from their rapid activity. Hummingbirds often nest along the edge of wooded areas, and they can adapt to urban areas as long as some trees are present. They like to perch on high branches, rather than in dense shrubbery. Vertical and layered growth consisting of trees shrubs and perennials is best. If trees or tall shrubs are not available, consider adding a trellis or tall posts as perches. Of the more than 300 hummingbird species in the world, only 16 live in North America, with less than a dozen of those inhabiting the U.S. and Canada. There are no hummingbirds outside of the Americas — all are from North, Central or South America. Pre-Planned Hummingbird Gardens are so easy! We’ve done the planning for you – just choose the one that’s right for your soil. For a limited time only: Hummingbird Station – Choose from a collection of hummingbird favorites for your custom 16-plant kit.